Many consider Southwest Airlines’ Companion Pass the ultimate elite flyer benefit. When used to its limit, the benefit can be worth many thousands of dollars over the course of a year. The Companion Pass enables frequent flyers to add another traveler to any and all Southwest itineraries for just fees and taxes. Like other frequent flyer benefits, the pass takes effect through the end of the year after it’s earned, meaning those who manage to earn companion pass status early in the year can use it for nearly two years. Seats for you and a companion on Southwest’s Boeing 737-800. Image by Southwest Airlines. The additional fees for Southwest’s international flights typically are under $100 each way. Domestic companions cost no more than $5.60 each way. Beyond those basic taxes and fees, the Companion Pass is basically a free-for-all. Holders can add travelers to itineraries for airfare originally booked with either cash or Southwest Rapid Rewards points. For Southwest flyers hoping to qualify for a Companion Pass, there are, however, key factors to be aware of when designing a plan of action. There are also some shortcuts! Earn 110,000 Southwest Rapid Rewards points within a calendar year. Flying 100 Southwest segments, though straightforward, is a much more challenging target for most of us. For points qualification, however, there’s more than meets the eye. There are many ways to earn points that qualify for a Companion Pass, and not all points are treated equally. Points converted from rental car loyalty programs and hotel loyalty programs were once a popular method to help reach the 110,000 point threshold, but Southwest closed that loophole in 2017. Southwest’s FAQ page lists qualification terms in detail to avoid traveler confusion regarding points earning eligibility. As referenced above, once a Southwest flier earns a Companion Pass, the traveler holds on to it for the remainder of that calendar year as well as the entire next calendar year. Thus, to maximize Companion Pass value, Rapids Rewards members are best off earning 110,000 Companion Pass eligible points (or flying 100 segments!) early in the year so that travelers have satisfied the requirements in January, February or March, offering them almost two full years of Companion Pass status. For folks aiming to qualify for a Companion Pass, that means eligible transactions with partners, flights on Southwest and – most importantly – opening Chase Southwest credit cards should be strategically timed such that points earning is frontloaded toward the beginning of the year rather than earned in the months leading up to the new year. 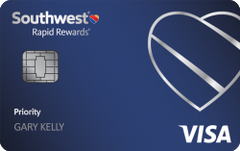 Southwest now offers three credit cards with bonuses for new cardholders. The base level Rapid Rewards Plus Credit Card ($69 annual fee) currently offers a 40,000 point sign-up bonus and the mid-level Southwest Rapid Rewards Premier Credit Card ($99) also currently offers a 40,000 point sign-up bonus. For business owners, the Southwest Rapid Rewards Premier Business Credit Card ($99) is currently offering an elevated 60,000 point sign-up bonus. The newest member of the Chase Southwest credit card portfolio, the Rapid Rewards Priority Credit Card ($149 annual fee), reviewed here, is in a tier of its own and boasts an opening sign-up bonus offer of 65,000 points to fast-track cardholders toward Companion Pass qualification. The Southwest Companion pass is one of the most valuable travel hacks out there for flyers (and their companions) equipped to benefit from Southwest’s expansive continental route network. Both understanding the distinction between which points do and do not count toward Companion Pass qualification, and also timing qualification for the beginning of the calendar year are the two key factors at play to keep in mind for earning and maximizing the Southwest Companion Pass. David Ghorbanpoor leverages his fixation on efficiency maximization to help friends and acquaintances optimize their wallets with the right credit cards for award travel. Beyond miles and points, David’s vocation lies at the intersection of software, venture development and intellectual property. A footy fanatic, David can be found outside of work reliving his (not so) glory days on a pitch in Chicago, analyzing a game or traveling to accompany his beloved United States Men’s National Team compete for relevance on the global stage, as he did in South Africa and Brazil for the 2010 and 2014 FIFA World Cups. Good post. I never paid that much attention to the Southwest companion pass as it just isn’t that valuable to me but I didn’t know that I could have earned it up until 2017 with transfers. That might of worked for me. Kinda minor but e-miles is gone btw as I’m sure you know. Thanks for your input DaninMCI. Good catch re e-miles (updated). Hi, Does the bonus points earned from http://www.southwesthotels.com count towards companion pass? Hi Anirban, the “base” points earned from hotel bookings on Rapid Rewards Partner Southwest Hotels should count toward the Companion Pass. Southwest’s exact terms state that “Companion Pass qualifying points are earned from…base points earned from Rapid Rewards Partners.” Given that Southwest Hotels is listed as a Rapid Rewards partner under “Travel” and “Hotels” and is not specifically excluded from points earning as other partners are in the terms, these points should count. The important distinction to make is that partner base points count, but partner bonus points (e.g. points multiplier on a car rental booking) do not. I would think that all Rapid Rewards points earned through Southwest Hotels are considered “base” points absent a stated multiplier bonus promotion, and my understanding is that others who have booked through Southwest Hotels have had their points count toward qualification. Thanks for the clarification, David. I’ve seen with the tons of “Bonus” points for some of the Southwest preferred hotels. Sometimes, it is in tune of a 5000 points/night for not so expensive hotels. If they do count to companion pass, it’ll make it much easier to get the pass. Hi Anirban, did you try this? I am curious to know if the bonus points counted towards companion pass. Thanks! For the companion, could it be a different person each time you book a flight, or do you chose 1 person and that is your companion for the entire year? Great question. Companion Pass holders are allowed to change who their companion is three times per calendar year. Although there is no online functionality to make the switch, it is a rather painless process to do over the phone with Southwest. Once the agent is provided with the new companion’s name and Rapid Rewards number, the change typically appears instantly. The important point to keep in mind is that all flight itineraries with a companion attached previously booked but not yet flown must be completed before pass holders are allowed to change companions. This can be circumvented by the pass holder booking future flights for themselves, changing the companion as soon as previous travel is completed and adding the new companion to the subsequent itinerary (so long as seats are still available). As of Dec 2018, can we sign up for 2 personal cards and get the bonuses from both to count towards our companion pass points accumulation?